Monitor Audio Bronze BX1 review | What Hi-Fi? To say these speakers have plenty to live up to would be an understatement. 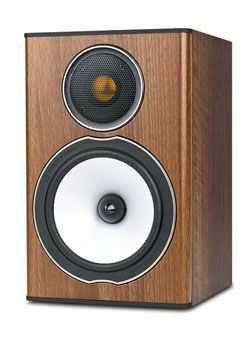 The two models we’ve seen so far from the Bronze BX range have been rather special: the £250 Product of the Year BX2 standmounts and the five-star, £500 BX5 floorstanders. Will the baby of the range rise to the challenge or crumble under the pressure? Certainly any literal pressure on these dinky cabinets – they’re just 35cm tall – won’t be a problem: they feel reassuringly heavy and rigid, and, as we’ve become accustomed with speakers from Monitor Audio, they’re nicely finished. There’s a single set of speaker connections at the rear, while round the front there’s a new C-CAM tweeter and mid/bass driver. A choice of four finishes – black, natural oak, rosemah or walnut – is the finishing touch. Sonically, they get off to a solid start with James Blake’s adventurous debut LP doing its best to stretch the speakers’ sonic boundaries. For such small boxes they make an impressive fist of filling our room, capable of delivering a large sound with scale and space. There’s good weight and punch, too, with Blake’s cover of Limit To Your Love featuring a deep, oscillating bass-line that the BX1s deliver with admirable control and power. Radiohead’s In Rainbows see the Monitor Audios faithfully present a clear, breathy midrange and just about keep on top of the complex rhythms that Reckoner features. There’s sometimes a slight lack of detail, confirmed by a comparison with our budget champs, the company’s Award-winning £250 BX2s – but it’s only a minor gripe. But we really like the BX1s – especially partnered with a capable integrated amp such as the Rotel RA04-SE or Marantz PM6003. If you value a stylish appearance as much as sound quality, then look no further. But for purists, they’re caught between two stools: the bigger BX2s cost a little more and sound plenty better, while the cheaper Mission MX1s are a worthy rival sonically. Regardless, the BX1 speakers are a fine addition to any budget system.